Recently I found on the Internet a Spectrum emulation program (hence the lack of updates. So... fun...) If the word Spectrum simply reminds you of a rainbow, or a dodgy puppet organisation devoted to defeating torches, then this isn't the article for you. But if it takes you back to those day-glo, halcyon days of hi-tech computers being those with 8k of RAM and Kempston joysticks, then hang around. For the novices, let me explain. The ZX Spectrum was, in the eighties, the pinnacle of technology. However, in the eighties, pinnacle meant a whole 2 colours and a several hour waiting time to load a game. Well, not quite, but that's what it seemed like. Instead of foolish devices like "disks," the Spectrum used the pure medium of tapes. Yes, that's right, games were encoded on normal everyday tapes, thus making game piracy easy as hell (you just copied the tape. Woo). As a kid, the Spectrum was the greatest thing known to man. But what's hard to forget is the fact that it was as crap as hell. Loading a game took approximately 30 minutes, and in that time, you were treated to a screen full of flashing lines moving up and down. Still, it was iconic, but it doesn't defend the fact that you could write a novel in the time that it took to load up "Trapdoor." That is, of course, if the game actually decided to load up. Because of the amazing cassette system, and the utter dodgyness of the Spectrum, so much as invading the air-space in a 3 metre radius of the machine would cause it to seize up... and no game for you, me laddo. I actually tried to design my own game - a sequel to the He-Man game. I spent ages, making it at school. Unfortunately I didn't realise you needed to program it... all I made was a sleeve saying "He-Man 2" and thought up what happened in the game in my mind. I even punched holes in the cardboard so that it would fit in the tape deck. Going home all excited, I put it in the machine.. and nothing. I didn't understand it! Obviously to me, the cassette part didn't matter, it was the sleeve that was somehow magic and contained the game. 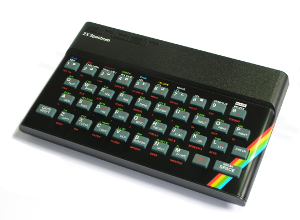 Still, I loved my Spectrum... that is, of course, until a mouse decided to make a nest in it, chew up the rubber keys and piddle on the joystick interface. But those memories... lost until I found this emulator program. There are about 500 separate games available for download on the net, and now I shall take you through the best - and the not-so-best. Get ready for a roller-coaster of pure adventure! Or not... When I first got this game as a kid (pirated, of course) I was very excited. I'd just finished reading the book (I thought it was 800 pages.. well, it seemed like it) and had decided that because I had done so, I'd be able to complete the game in a matter of minutes, while my friends looked on in stunned disbelief. However, the game foiled this by being utter shite. It took me about a week to actually learn how to get out of the house (above). I did, however, manage to dig a big hole. And I mean big. After actually getting out of the house, I came across some trolls. Who ate me. And I kept on getting eaten. I believe the purpose of the game was to get eaten repeatedly, so in that regards I completed it. Now, I never had this game, nor even knew it existed. But upon seeing this game for download, I knew it had to be mine. Basically you can choose to be 5 Transformers in turn - Prime, Bumblebee, Hound, Jazz and Mirage, and try to avoid all the villains. You can even transform. Good, no? Pure massacre! So I suppose that it's like Transformers in that it's reminiscent of the first 20 minutes of the movie where every single character dies horribly. And transforming... what does that do? Well, it makes it so that if you bump into anything, you explode. Neat. No, not a game based on the British Prime Minister of the 19th century (though that would be neat), this is instead about some mutant egg who must do... stuff. Loading this game up, the splash screen proclaimed it to be "The Ultimate Cartoon Adventure" so I had high hopes. Oh, but they were dashed against the cruel rocks of reality. I thought I remembered this game from the Acorn at my primary school, but thinking about it, that was a sequel, where Dizzy got to wear a hat and talk to people. In this game, all that seems to happen is that you fall down pits and die, get attacked by bats and die, and touch spiders, and - you've guessed it - die. Now, shoot me down in flames if I'm wrong, but when a spider touches an egg, the egg doesn't shrivel up and explode. If they did, egg sales would go through the roof, with people wanting to try that baby out! A thrilling adventure where you get to deliver.. papers! Sounds exciting, no? Well actually it is surprisingly addictive. As the Paperboy (let's call him Dave for sake of argument), you must deliver newspapers by shooting them at houses. There are no cyborgs or spaceships, but bins and road workers prove just as cunning adversaries to poor Dave. And that's not forgetting that he can shoot papers at gravestones (handily located outside houses). Although as the screenshots above testify, when I play, all I can seem to do is crash. The fun! Basically, you play a small boy on board a pirate ship. The pirates seem to have nothing better to do than walk back and forth on the spot, so you have decided to nick all their treasure. You do this by getting keys to unlock doors and climbing up and down ladders. Doesn't sound fun? Well it is, even down to the annoying-as-hell music, which is just 5 repeated notes. There's loads of ways of dying, of course. Fall more that 2 mm and you die.... and as seen in the first picture, some of the treasure is.. explosive! OH NO! The middle picture shows the most terrifying apparition at all. Even hard-core Booty players (I assume there must be at least one, you know the type - 20 stone, Spectrum glued to their lap, and organiser of BootyCon '96) must wet themselves. Yes - it's the Death-Bird. The pirates might not get the job done, but their canary does... it flies onto the screen in random places and murders you forever! Well, not quite, but you get the picture. There's also the Death-Rat, but that's not nearly as exciting. And it's pink. Of course, stupid coding also tries to thwart you. In the case above, I got a key to door number 1. But jumping off the lift made me pass through the door without opening it, and picking up key 6. So I was trapped with no way out. Whoopy. Without doubt, Bubble-Bobble was one of my favourite Amiga games - you play either a blue or green dragon who fires bubbles. But the excitement of getting the Spectrum version onto my computer was short-lived. Just look - the dragon isn't green - it's clear! Sacrilege! And I can't get it to fire bubbles, so it's off to the bin for you. Ever wanted to be a tiny robot gardener entrusted to protecting a sunflower? Well, now you can! Yeah! By picking up different colour repellents, you can kill all the bugs. Polystyrene (above) kills caterpillars; water kills bees, and weird funky lasers kill spider-things. Unfortunately this game is impossible to play without a joystick, rendering the emulated game harder than Rocky and He-Man combined. Darn. When I was little, I loved this game. I remember one day at school, my friend and I were raving about it, since when we got home, we'd play it. Unfortunately, the game would never load - the hi-tech cassette had gotten "mangled" to use the correct terminology. And so I was sad, never being able to play it... until now. The plot is this - Dan Dare must stop the Mekon from taking over an asteroid that is his anyway. Somehow, the Mekon being in control of the asteroid will destroy Earth! ARGH! Dan Dare must run and jump and get repeatedly shot to bits and fall down holes in order to stop this vile plan. After 10 minutes of playing, however, I had killed all the villains and was relegated to running back and forth. Later, I discovered that there were lifts in the game, and so I had even more opportunities to find more villains to murder me horribly. You may notice that I didn't mention Trapdoor.. well, that classic gets an article all to itself! Coming soon. So what have we learnt from today's lesson? That if you're a game with a whole 8 colours, death comes easy? That cassettes rule? Or that I should stop having fantasies about outdated games consoles? In a lame attempt at getting out of putting any effort whatsoever in today's article, I just scanned in my second epic tale from primary school, a sequel to "Adventure On The Island." Bet you were looking forward to this, eh? There are a number of points to be made. Firstly, this was the first tale to be written on computer (the school's hi-tech Acorn, with it's 5 inch floppies) and... well, it's just interesting, dammit. Secondly, whilst again I have put the text down here as I originally wrote it, I have taken the liberty of finally correcting a mistake made by the teacher, after I forced her to type it up, namely replacing the word "rocket" with "rock" in chapter 4, thus making the story make sense again. You will not believe how pissed off I was at the time. One day I went out exploring and I suddenly came across a wall. There was some Ivy on the middle bit. Then I saw a door on the wall. The door was a sort of semi Circle shape. It had Ivy growing on it.It had rusty hinges and a rusty lock .I wondered what was inside so I charged at it.But it didnt budge. Then my feet felt something hard. I stepped off and picked the hard thing up the hard thing was keys then I tried one in the lock! I pulled the door but the door didn't move, so I went and got Daniel Duke but he was in the middle of a game on his computer. I had to wait three hours before he finished. Then Daniel had to put his name in.After Daniel had put his name in I said "It's about time!" Daniel went with me to get Tom but Tom was making an invention so we had to wait four hours before he finished. I said "It's about time" We went to the door and used Daniel's head as a battering ram. Daniel's head broke through. Tom said "The door leads to a dimentional portal,"
Tom stepped into the dimensional portal. Then Daniel did. Then I did. The door shut and we zoomed into the middle of the dimensional portal. There were three doors. Tom chose number two so Tom went in number two Daniel didn't want to go in so I threw a banana in and Daniel zoomed in. Then I got in and shut the door. Then some monsters appeared. Daniel drew his banana and shot some monsters. I drew my sword and killed some monsters. Tom drew the curtains and he strangled some monsters. Then we went ahead. We were searching for the right portal to get out. Daniel had stopped for a tea break, I had as well. Tom kept on walking. I filled my cup with tea then I broke it. Then Daniel did the same. Tom had walked on four miles when he saw a car shaped like a banana. The car stopped. Daniel poked his head out of the banana car and said "We were so far behind that Matthew got this car out of his pocket." Tom hopped in the car. What they didn't know was that they were being watched by an evil being called Zarak. Zarak was sending for all the monsters he controlled. When all of the monsters came Zarak said, "Destroy the Super Heroes!" Back in the banana car Tom saw lots of monsters charging at them. He said. "Put on the force field." So Daniel put on the rocket boosters. I said to Daniel, "You spud head, you were supposed to put on the force field. Now we're going to crash into that rock!" Daniel threw Tom into a bin. Then the rock seemed to open. We sped into Zaraks base. Suddenly Zarak grabbed the bin and said, "If you want your friend you have to get him." Then Zarak got Tom upside down and attached Tom's leg to a rope above a pot of disintegrating liquid. Zarak said, "The wrong move and your friend is history!" "Actually my name is Tom." said Tom. Zarak pulled a lever and the floor opened up and Daniel and I fell down under it. Daniel said, "Look, the doors put together again!" I said "We don't know the way. Daniel said "Let's call the space pods." I got out my communicator disguised as a watch and said, "Matthew to base, Matthew to base. Do you read me?" The reply came, "We read you. What do you want?" I told them to send an army of space pods. In no time the pods arrived and we got in. Chapter 6 - The battle's end. "Zarak's base is dead ahead," said Daniel. "Don't use that word until this adventure is over, " I said. "I know how to get Zarak," Daniel said. "How?" I asked. "I'll use the robots." Soon the space pods landed all the robots and Daniel and I got out into Zarak's base. But it was too late. Zarak had bonded with Scopenok. Suddenly he got bashed. I ran and rescued Tom. Then we got into the space pod and all got safely home. There, another epic over! Did you spot the twist ending, with the sudden inclusion of "Scopenok"? Well, I sure didn't, and I wrote the thing! For lame people like me, what a mug! Why, since of this pain I was rid? Well, the drug cost me five quid! Over a centremeter long, and not hollow! But leave alone if you're asthmatic! Give him drugs, though you'll have to pay! PS Do not feed to scorpions. Trust me. For a time, my productivity had delved to an even lower level than usual (no mean feat) with my discovery of the wonderful world of online gaming. No more was I a lonely nerd sitting at my desk - I could play with other lonely nerds online and thus climb the nerd hierarchy! I caught the bug quite bad, though I did not yet become bad enough to require the wee bottle and to prevent this I've left strict instructions with my housemates to kill me if they catch me sneaking around with a bottle full of suspicious liquid. 2) It is a 2D platformer. No struggling with a horrible interface and jaggedy, slow graphics - its SUPPOSED to be like that! Maple Story involves painful death for the most part. And snails. The only downside is that it is not a story about maple leafs which I was lead to believe, causing much distress. But I soon got over my disappointment and got going. You play a little anime character , starting out in a t-shirt with only a trusty stick for company, and you go around hitting snails for experience and money. This is basically the entire game, only every five levels you replace 'snails' with the next toughest monster. So you're wandering about killing snails for a few hours. Is there any more to it? Of course! Once you reach lvl 8 or 10 (depending on what class you want to be) you can choose a job. Below are the types you can be! - Damage varies wildly. One hit you can do 10, the next 100. Well done! - You have slightly more hp than a small ant. If something touches you, say goodbye! - You get to shoot arrows. ARROWS. INTO MONSTERS HEADS! - You can get a goatee and run around pretending to be the Green Arrow! - Stars cost a ridiculous amount of money. As in the millions. Jump quests are forged in the very fires of hell itself. You start at the bottom and try to jump on platforms to the top of the screen. When you get near the top you fall off and have to start again, creating a never ending cycle of torment and despair. The prizes, again, are things like a small stick for your effort. U R HAX - Oh my you seem to be breaking the rules of the game and hacking in order to level faster, you scoundrel! Every monster you kill drops hard earned cash. A snail for example drops around 5 meso. Higher level items cost millions of meso, along with money you will need to pour into your potion addiction. Yes, if you like being poor, then this is the game for you! In this respect it is good training before you go to university. If only I had such knowledge before I went, I wouldn't have spent all my money on those magical beans! Of course, there are ways of making really decent cash. Monsters can drop rare items which you can sell to players. And you can set up shops too as I have done. Above you can see me dominating the... comedy hat market. No-one makes comedy hats like me! Oh once you were so proud, now I am the king and you are the prey... Once you finish on Green Snails, you get to move on to Blue Snails. After these, you get to kill Red Snails. It is a never ending snail paradise! When you are on the boat to Orbis, the Crimson Balrog can appear. Most people run away and hide. What fools. Stay outside, he actually comes to give you DELICIOUS candy and presents. So while you are munching on your feast, everyone else is hiding, the silly billies. This finishes my ever so brief look at the monsters of Maple. But remember there are many more that can pop up and kill you, don't worry! In conclusion then, Maple Story is the perfect game for you if you enjoy mindlessly staring at a screen repeating the same simply commands whilst dealing with a never ending deluge of idiots (a bit like my last job really). It is also the ideal alternative to self-harm. And it is more addictive than crack. Curse you internet!